Boston Red Sox second baseman Dustin Pedroia gives a thumbs-up during a workout, Saturday, Oct. 7, 2017. He'll be activated by the Red Sox on Friday after missing Boston's first 50 games while recovering from knee surgery. 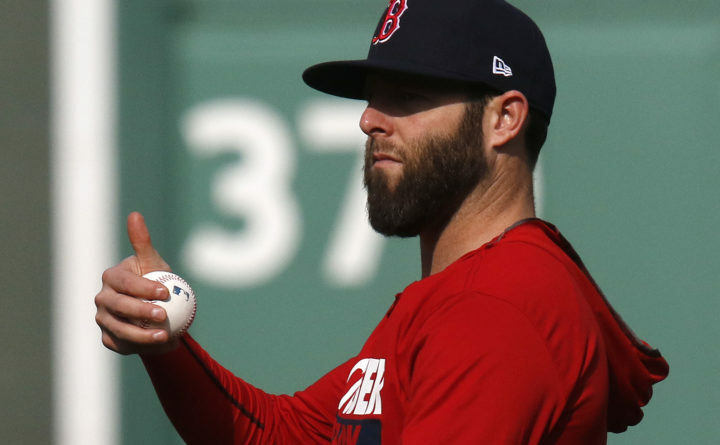 ST. PETERSBURG, Fla. — Star second baseman Dustin Pedroia will be activated by the Red Sox on Friday after missing Boston’s first 50 games while recovering from knee surgery. Manager Alex Cora said Thursday that Pedroia will come off the disabled list for a weekend series at Fenway Park against Atlanta. Pedroia’s return to the AL East leaders will come exactly seven months after cartilage-restoration surgery on his left knee. He played his final game for Triple-A Pawtucket on Thursday, finishing 1 for 14 in his five-game rehab assignment. The 34-year-old Pedroia is in his 13th season with the Red Sox. He was the American League MVP in 2008 and ranks sixth among all Red Sox hitters in doubles (394) and stolen bases (138), and eighth in hits (1,802) and total bases (2,646). Pedroia will start either Friday or Saturday’s game, and will bat somewhere in the lineup after first or second. Cora plans to stay with Mookie Betts and Andrew Benintendi in those spots. “Now that (Pedroia) is healthy, he’s going to be able to drive the ball, so he’ll have a lot of traffic in front of him wherever he hits in the lineup,” Cora said. Eduardo Nunez, who has started most of Boston’s game at second base so far this season, will go back to a utility role.